It’s been a week since I completed my first triathlon and I’m still torn with how to feel about it. While everyone seems pretty proud of me for completing it, the tri did not go how I’d envisioned (well, to be more precise, it actually went down exactly in the way I envisioned it in the worst case scenario version of it). I haven’t had an enormous desire to try a triathlon. I don’t mind biking — when it’s at a leisurely pace and enjoying the scenery. Swimming, I haven’t done laps pretty much since I was doing Red Cross swimming lessons as a kid, so the last time I’ve done any sort of distance was when I was nine years old or so. 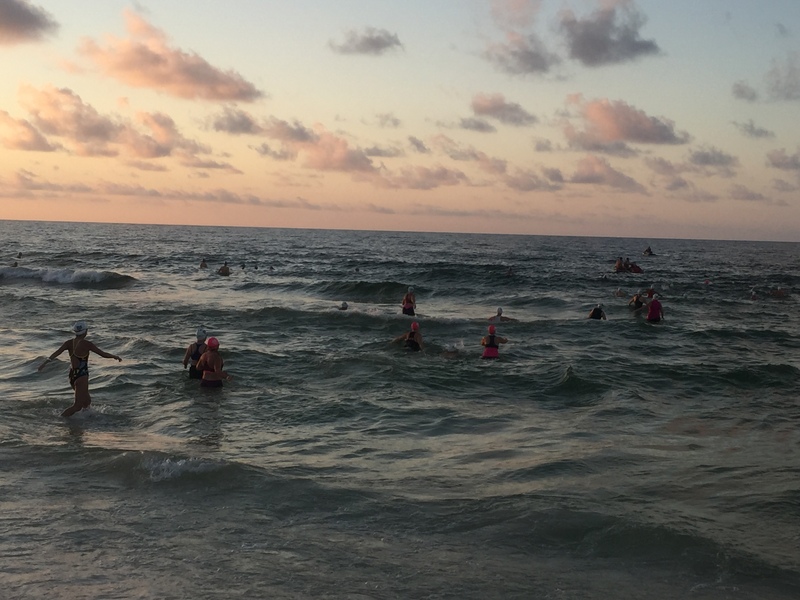 But I was invited as part of a travel junket to visit the Gulf Coast of Alabama, and an optional part of the itinerary was to take part in the Brett Robinson Coastal Triathlon. 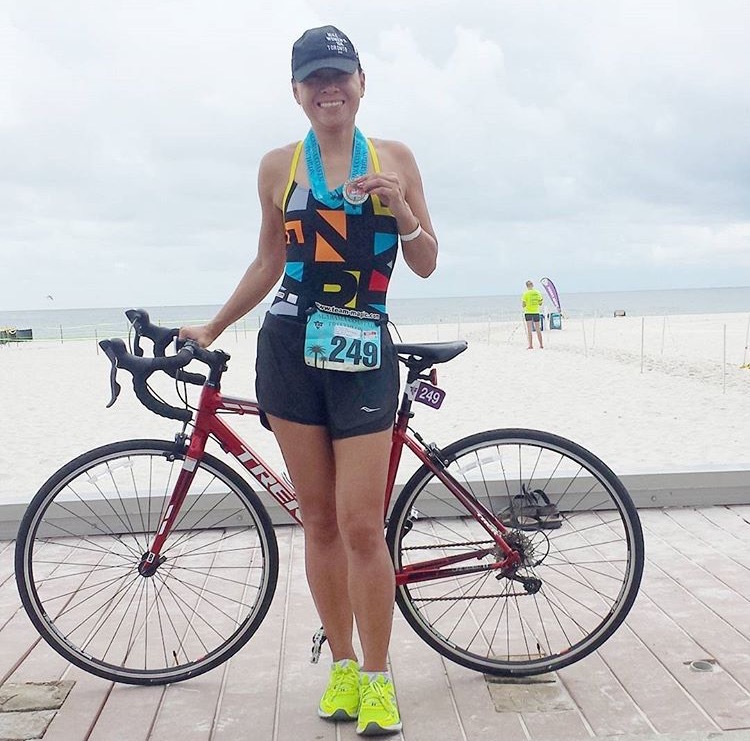 While the main event was out of the question, when I read the distances for the sprint, it didn’t seem entirely impossible: 300-yard swim, 10-mile bike, 2-mile run. I have a decent idea of what a kilometre is and approximately a third of that distance swimming, I figured if I trained enough I could muddle through 300 yards. The bike: as long as my rental did not have clip-in pedals, I know how to ride a bike so I could get through that, and 2 miles of running is nothing when my short runs are typically 10k. It was the swim that made me the most anxious but I had swimmer friends who believed I could do it, and I had my friend Yuki (who’s completed Ironman) helping me with tips and advice. I had about eight weeks to train. I started off gung ho and swam regularly. But then I went to WayHome. Then eight days in Greece. Then a road trip to Buffalo. Being out of town so much threw me off, and then I realized I had a month to learn to swim 300 yards. And so I ramped up my distance quickly and grew more comfortable in the pool. I also went to do a swim at very calm and quiet Gulliver’s Lake in Hamilton with Yuki to get a sense of swimming in open water. But when it came down to the triathlon last Saturday, I don’t think any more time swim training could have ever prepared me because I hadn’t been training in the ocean. 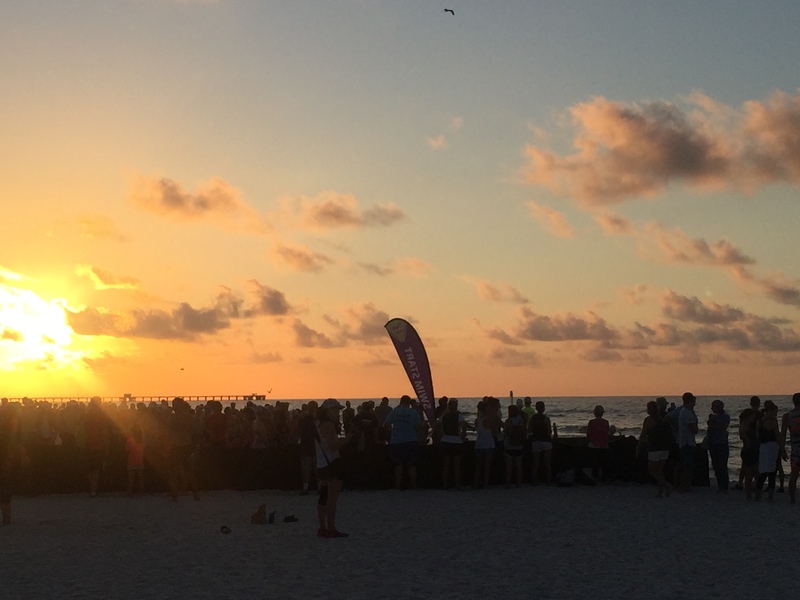 I think I’d envisioned the race taking place in a quiet bay of the Gulf of Mexico, something like the very peaceful Wolf Bay we had SUP in the day prior. Nothing prepared me for the big ocean waves I was faced with Saturday morning. With four buoys set up in the water (the swim route basically was 100 yards into the water, 100 yards across, and then 100 yards back to shore), most people waded on foot to at least the first buoy since just beyond this first buoy you could still stand and the waves were breaking just beyond this buoy. I went into the water rushed (I’d somehow missed my turn by a few people in the time-trial start because I hadn’t budgeted enough time to find my spot in line — that’s me with the white swim cap on the left in the photo above), waded close to the first buoy and then attempted front crawl. The waves were still significant here, and after attempting the crawl for maybe 10 feet and being overwhelmed by the water and getting very nervous, I decided I’d better to backstroke until the second buoy and once I turned that corner, then I could front crawl across since I wouldn’t be swimming into the waves and it’d be easier. Except it never got easier. The waves were still strong and my panic was increasing so I continued in backstroke and water washing over my face (and swallowing water) was making me too nervous to check what direction I was going. Which meant I veered severely off course, into the centre of the square created by the buoys, and a rescue person came to tell me I was off course. I started to make my way back on course, but by this point I was breathing so fast and shallowly and it was slow work getting back on the course and full-on fear had set in. In my head I kept telling myself to get control of my breathing and to slow it down, but it wasn’t working and all I could think was “I’m in trouble.” I would pause when I could to look for a lifeguard on a jetski or paddleboard so that I could grab on to take a break, but they were always far away and I honestly didn’t know what to do. Thinking about it after, my clear and emphatic NO I said in reply, I know myself and that clearly shows how panicked and scared I was. I heard them tell the lifeguard I needed help and he must’ve been close as I was soon clutching onto his paddleboard to take a breather and try to get my breathing under control. There was one other swimmer also holding onto the SUP, and the lifeguard said to him “I have to stay out here so I can’t take you in, but if you want to be taken in, I can get my colleague to bring you in.” I think at this point the other swimmer decided to swim to shore; to be honest, I was too busying trying to collect myself I don’t know what happened. But hearing the lifeguard mention being taken in planted the idea in my head. Even though I already knew the answer, I asked “If I get taken in, I get disqualified, right?” He said yes. It wasn’t so much the DNF that bothered me, although it of course not what I wanted to do, I didn’t want to miss the biking and running. “But you just have to make it to the next buoy and then you can pretty much walk in,” he said. I turned to look at the distance to the next buoy and decided to try to slow my breathing down for a bit longer before doing the backstroke to that point. Which I managed to do, and then as soon as my feet could reach the bottom, I started to walk to the shore. Another swimmer was beside me at this point and she looked at me and said, “This is sheer hell.” I laughed and agreed, happy to not be the only one struggling in the swim. Any visions I had of being quick in my transitions were no longer important after such an awful swim. I walked to get my bike, one of the only few left in the transition area given my slow, slow swim. On the bike, I didn’t cruise but did a comfortable fast pace and I relished every second of it while also trying to slow down my breathing and to not have my heart beating so fast. It rained slightly during the bike, but not a downpour, and I managed to pass people on the bike portion. After dropping off my bike in a quick second transition, I was relieved to just have a 2 mile run left. While I’d wanted to run it without breaks and to push a little harder, I knew I wasn’t winning any medals, haha, and my legs were weary and I was still breathing way too quickly, so I took a walk break or two. I finished 234 out of 303 participants (if I’m interpreting the stats correctly; they’re broken down in separate charts so you have to scan the entire page to make sense of it all), and I’m OK with that. My swim, which I had timed to be 8 minutes for 300 yards in the pool when I was training (and which I’d estimated for me to do in 10-12 minutes for the race) took me 17 minutes (whereas it took most people about 9-10 minutes). I was actually surprised it was 17:19 because I felt like I was in that water fearing I was going to drown for at least half an hour. Had my swim time showed 45 minutes in the results, that wouldn’t have struck me as odd. That is how long it felt. My bike, 38:09; run 19:47 (which is 4th in my age group for the run). What I crushed? The T2 transition, which I completed in a mere 1:15 (5th place in my age group, hahahahaha!). Is there an event where I can just crush transitions… My overall Tri It On time was 1:20:13. If I hadn’t been able to take that break holding onto the lifeguard’s paddleboard (which I only knew I was permitted to do thanks to Yuki’s tri tips), I am quite certain I would have had to be taken in with a DNF. Which is why I don’t think I can ever do a tri in an ocean ever again. The only thing I feel that would prepare me for a tri in the ocean is to train regularly in the ocean…and I don’t exactly have an ocean here in Toronto to train in. I don’t even know if I’d do a river or lake swim; maybe a lake if it was a notoriously quiet lake…and a warm one. I hate cold water. So for me, it wasn’t a great, highly positive experience. Looking at the pics of me entering the ocean for the swim makes my heart beat faster just remembering how that swim felt with my heart racing and my breath out of control. I keep being told that I did great for my first tri and that the swim is everyone’s greatest fear in triathlons and that open water scares lots of people, and that I’m too hard on myself. I suppose I’m glad that I tried, and that I completed it (which was my sole goal, and I had hoped to not be last place, although it’s such a personal thing — race times — that I don’t think there should be shame with finishing last — because at least you did it, right?). Right now, I know I will continue to swim laps in my pool just as an alternative workout to running, and I’ll try to bike for fun as well, so yes, there is something good that’s come out of this. And I have some pretty decent race pics from the bike and run (I’m so smiley in them because I’m so happy to not be in the ocean anymore!). Oh, and if you want to know more about my rad swimsuit, I blogged about it on the iRun blog. Onto the next race: tomorrow’s RBC Race for the Kids! Running — running, I can manage! You had a great race, Karen! 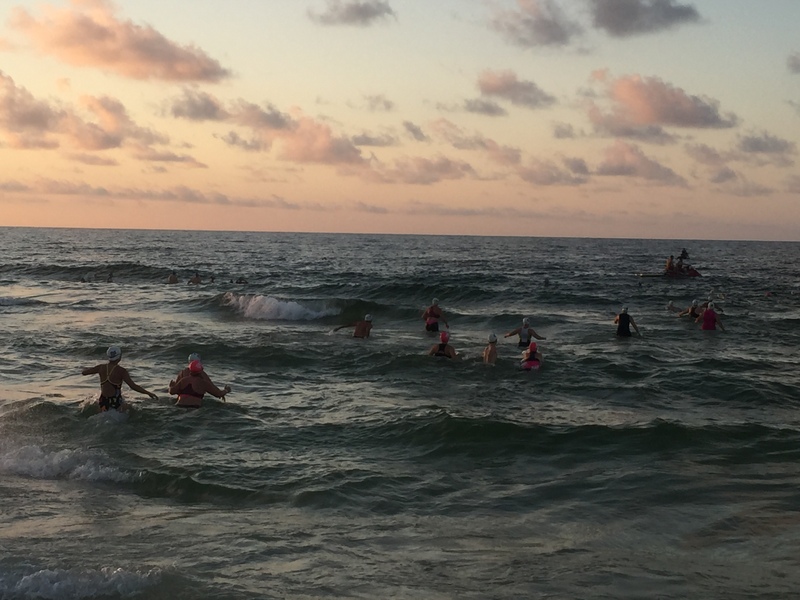 You’d be surprised (or maybe not) how many people DNF as a result of panicking during the swim–and in calm lakes, too, not just choppy ocean swells. You totally recovered per the race plan, and finished your tri! That’s fantastic–congratulations! OK. I’m trying to come around to feeling good about this tri…but still struggling! But your support and encouragement means the world to me!